This coverlet is the softest to the touch! The design resembles a nice watercolor painting. I just wish it was a little longer. I love it very much as I enjoy the included decorative pillows, too! I dislike using shams and I have found they make a wonderful window valance folded over & placed side by side! Add splashes of color to your bedroom with the Tamira coverlet set. The large scale paisley print has pops of blue, green, and purple. The coverlet reverses to a solid green that accents the green on the face of the comforter. With a microfiber polyester face and a brushed fabric reverse, this coverlet is soft to the touch and machine washable for easy care. Two matching standard shams and three embroidered decorative pillows complete the look. Dimensions 104.0 In. X 94.0 In. X 0.25 In. This is a wonderful item! I washed it before putting it on my bed, and it washed up beautifully. There was no fading in the wash and it came out of the dryer (low setting) wrinkle-free. I ordered a full/queen for my queen-sized bed, and it hangs low enough on both sides of the bed to cover the top sheet and mattress. The colors are just as shown in the picture: a light creamy-white background with accents of brown fading to bluish-gray, soft aqua blue fading to bright teal-royal blue, and lime green. The accent pillows were well-constructed, with the smallest one embroidered with shiny thread. (There were a few loose threads on this pillow I needed to clip, but no big deal.) The fabric is soft polyester but feels more like suede-cloth. The binding, which is dark teal-royal blue encases the entire quilt. The "quilting" is machine stitched, and the backing is a lovely soft aqua color. You could even reverse it if the pattern is too much for you! The shams are of the same quality construction. The quilt is light-weight, definitely a summer quilt, but here in California I will use it year-round. I am really pleased with this quilt. Very very nice !!!!! Soft and wide and long enough, I ordered the queen size. This is a great light weight quilt for spring/summer and the pattern and colors are true to the photos. I was also impressed that the set came with three throw pillows - each of which is beautiful and helps bring a whole look together for your bed. For the quilt, 2 shams, and 3 throw pillows, I thought this was a fantastic value. OK, I was putting this on a guest room bed. Our 26 year old daughter said the pattern was too "grandma looking". I picked it because the painter was to paint that room a "mushroom brown" color and it came out purple with tan carpet. I wanted something that would brighten the room and tie the two colors together. This is perfect, love the pattern. It is not "grandmother-like" at all. Once our daughter felt the soft material of the bedspread and pillows, she changed her mind. She has been sleeping there this week, while in town, and said it was a great bedspread. Not too hot for summer and because of the material you want to use it for a blanket too. The pillows are a great compliment and the price you can't beat for great quality. The queen size on a queen bed does not reach the floor on the sides, so a duster would be helpful if you don't have a nice wood frame to show off. I would definitely recommend this. Though the colors blend, it truly does brighten up a dark room. This is a very nice coverlet. It's lightweight and the watercolor design is very pretty. It has a beige background which is exactly what I wanted. I had an all beige bedroom with teal accent lamps, rug and bench and this pulled it all together. Only used one of the accent pillows, the smaller teal one. The others look cheaply made and didn't care for the colors for my room. So I'll just donate them. The pillow shams fit a standard size pillow and are very nice. I'm very happy with my purchase, makes the room look great. Really nice variety of colors. Unlike what others have said, I don't think the colors of the spread are too bright. I'm not really crazy about the color of the pillows they have to match. They go fine with the bedspread, but they are a bit brighter than I would like. But the really nice thing is that there are so many shades of greens and blues, that the color of the pillows will be easy to change and they will still look great with the bedspread. It is also very soft. I'm very happy with this purchase. This coverlet set is perfect! The patterns remind me of watercolors. The accent pillows are the perfect size. 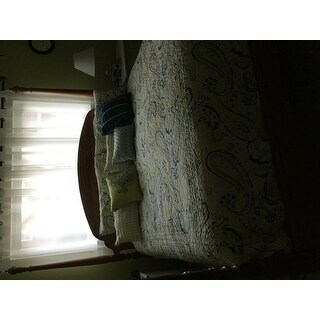 The edging to the coverlet and shams are teal. I found the Sleep Philosophy and Liquid Pima Cotton 300-Thread Count Sheet Set to be a perfect match. This is truly a beautiful coverlet set for such a bargain. This is so pretty in person and the brushed fabric is so soft! 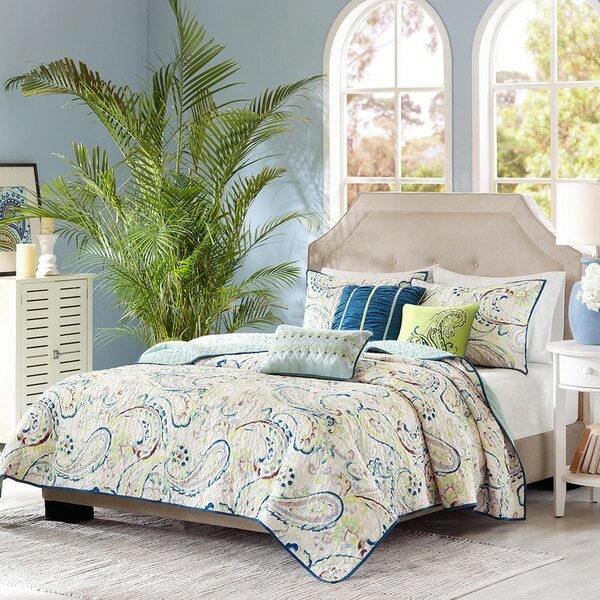 The fresh, updated paisley pattern has a watercolor effect and colors include deep peacock, aqua, chartreuse, lime, taupe gray and a touch of pale lavender. The background is cream, not white. The pillows are cute and I used them in other rooms of the house so this set is a good value. It has held up under 3 washings so far, but I let it hang dry which helps prolong the life of most fabrics. Perfect! Much better quality than we had anticipated. We actually used the queen size on an XL twin so it covers the bed completely. We got a second set for the other XL twin. We ordered the king size set so we have the ability to push the twins together to make a king bed. With the shams and pillows we got, we can create different looks. The colors are beautiful and the fabric soft and nice. This is my favorite bed set out of all of the ones I’ve owned. This quilt is not too hot or too cold and is just what I was searching for. It’s hard to find a solid light weight quilt and this one will be on my bed for as long as possible! This quilt came out of the bag very soft, but when I washed it, it was ULTRA soft. It's muted and not too masculine or feminine for a couples bedroom. This product is an excellent value for only ***. The colors are exactly as they appear, fabric is soft and the weight of the Coverlet is perfect for a summer only topper or all year with a blanket underneath. I had been looking for these color combos for awhile and am very pleased with this purchase. I wanted a transitional set for my bedroom as my comforter was proving to be too warm as warmer weather has arrived. This fits the bill. Great colors, weight and has a nice texture. Love it! I loved this bed set. I have a few different quilts similar to this as I like to mix it up every once in a while. The quilt is lightweight but heavy enough that you still feel covered and "safe" when in bed. I am someone that likes the weight but doesn't like the heat. This is pretty breathable. And the decorative pillows are a nice bonus! Wonderful quality, beautiful colors. Definitely satisfied with this purchase! This is piece is so beautiful! I read all the reviews and took a chance. It washes wonderfully, no ironing needed and its so soft. It really brightens up a room. The only negative thing I can say is if you want to get extra pillows etc... the colors are very hard to match up. I just accented with a chocolate throw blanket, bed skirt and a couple throw pillows and it worked beautifully! This is great purchase for the price. This is a beautiful quality bedspread! The color combination is bright and clean looking and it’s so soft. I was looking for a lightweight spread that can be washed easily and this is just perfect. The pillows were a great add on to make the set look complete. I am thrilled with this beautiful purchase! Light weight, fits bed better (hard to find for King size), soft to touch! Closest to colors I like. Would recommend this product!!! Love the colors in this coverlet and it is so soft!!! One can never can go wrong buying Madison Park bedding. They wash and wear well. Priced right and always good quality! Loving the new look in daughter bedroom!! Still love this set! Soft and durable. I love the brightness it brings to my room. Ordered this for our lake condo. I love the colors and that it was very true to the photos. The quality is great and I have already washed it, and found that it washed up very nicely! Just the set I needed to pull my master bedroom together. Good quality, Luxurious feel. The decorative pillow finish off the look perfectly. I have pear green bedroom walls, and an adjacent French blue bathroom walls. I despaired of ever finding bedding that had the same colors, but this comes pretty close. I’m not a fan of synthetic fibers which I think look sort of cheap, but for the price of this set, I’m happy with it. The construction is very nice. "Do the decorative pillows have zipper?" Lovely pillows but no zippers. "What is its total weight in a bag? Thanks!" This coverlet set weighs approximately 11 lbs. "What does this set consist of? Does it include a bedspread as well? What about pillows? I am looking at a King size." Hello divya, this lovely item features the coverlet, two matching shams, and three decorative pillows. Thank you for shopping with us. This item if bright and colorful! Beautiful colors and like the designer (madison park). "Hi, Is the microfiber tacky feeling? I normally don't like microfiber anything." Hello cab1176, we depend on our reviews to provide this type of feedback. There are 32 reviews on this item, hopefully this will provide your with the feedback you need to make your decision. Thank you for shopping with us. "What size is the king and what size is the queen pleAse?" Hello Cindybutler, Queen Dimensions are Coverlet: 90 inches wide x 90 inches long; Shams: 20 inches wide x 26 inches long; Pillow: 18 inches wide x 18 inches long; Pillow: 16 inches wide x 16 inches long; Pillow: 12 inches wide x 18 inches long. King Dimensions are Coverlet: 104 inches wide x 94 inches long; Shams: 20 inches wide x 36 inches long; Pillow: 18 inches wide x 18 inches long; Pillow: 16 inches wide x 16 inches long; Pillow: 12 inches wide x 18 inches long. You can also see these dimensions on the product page. I hope this helps. Please let us know if you have any additional questions. Thank you for shopping with us! "Is the microfiber noisy? Does it slip off the bed?" Thank you for contacting us, Plgal7. 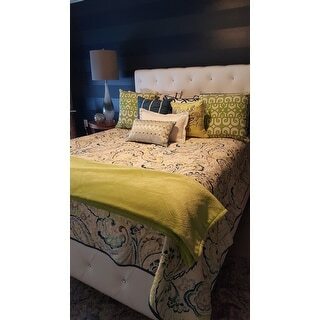 This quilted coverlet is getting great reviews. The microfiber fabric quality will not allow the fabric to “Slip off” the bed. It is quilted with a nice fabric feel but not slippery. Please let us know if you have any further questions.